The presentation of the STR Theatre Book Prize for books published in 2014 took place on Friday 22nd May 2015 in the Val Parnell Suite of the London Palladium, kindly made available by Really Useful Theatres. A gathering of theatre and publishing people, media folk and academics heard the judges speak about the year’s books which were all on display and the Society’s President, actor Timothy West CBE, announced the winner and made the presentations to short listed authors and editors. Unusually the five titles on the short list came from just two academic publishers but the subject of the winner could not be more populist for it went to Oliver! 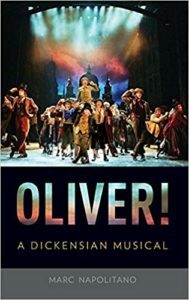 A Dickensian Musical by Marc Napolitano (published by Oxford University Press). Professor Napolitano could not personally be present to receive the award. He is on the staff at West Point, the famous US Military Academy – it is surprising in what varied places you can find theatre buffs. Christopher Morahan CBE, a theatre, film and television director with an impressive record of work at the National Theatre, Chichester Festival Theatre and in the West End and director of iconic television drama such as The Jewel in the Crown and A Dance to the Music of Time. Vivien Gardner, Emerita Professor of Theatre Studies at the University of Manchester.